In 1967, the Los Angeles County Museum of Art (LACMA) piloted its Arts and Technology Project. Over 50 years later, LACMA is resurrecting the program with the hope that it will once again provide artists the opportunity to interact with cutting-edge technology. The purpose of the new program, called the Art + Technology Initiative, is the same as that of the original: to produce creativity and innovation in both the arts and technology sectors. In the 1960s, this goal was achieved by orchestrating artist residencies at leading technology companies. This time, artists will be working in a renovated lab space in the Balch Research Library. During the original project, some of the artists and technology companies were skeptical that collaboration between the two fields would be beneficial. The idea that art can inspire the entrepreneurial spirit was just emerging; Maurice Tuchman, then the Senior Curator of LACMA, believed that growth in the collaboration between the two sectors was one of the most pressing needs of the era. Now, integrating the two fields is a commonly accepted method to inspire creativity and progress. This shift is evidenced by the support that the new Art + Technology Initiative has received. According to Victoria Pipkin Lane, Executive Director of the Quality and Productivity Commission, the Los Angeles County Development Fund unanimously approved a grant for the project with the intent “to expose the public to meaningful experiments with emerging technologies.” Companies such as Accenture, DAQRI, NVIDIA, Google, and Space X are sponsoring the initiative. In addition, LACMA has received enough support that it will be able to renovate the space for the project and award grants to other institutions. The original project featured 12 week residencies, many of which were expanded to allow new concepts and ideas to develop more fully. Companies provided artists with machinery and resources needed to create the art. Much of the work that was conceived and produced was highly conceptual, featuring transitory imagery, vibrations, flickers, and illusions. 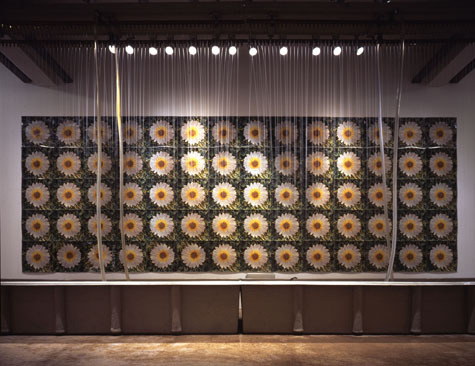 Among the artists that participated were visionaries such as James Turrell and Andy Warhol, who collaborated with Cowles Communications to produce Rain Machine (Daisy Waterfall), a wall of 3-D flower images superseded by a deliberately rudimentary rain machine. Some of the artists had their work shown at Expo 70 in Osaka, Japan. Though the final products were impressive, Tuchman stressed that the major goal of the project was to explore the collaborative process and generate new ideas. This idea is at the core of the new initiative as well. The artists will submit proposals for a spot in the lab, which will be an “open and impartial space for artists to explore new frontiers.” Artists, technologists, and engineers are encouraged to apply, a move that breaks down silos between the sectors and encourages participants to see themselves outside the boxes of their professions and instead as creative collaborators. According to LACMA, proposed projects should show artistic merit and engage with an emerging technology, such as digital graphics, robotics, or mobile devices. Workshops and classes focused around exploring the boundaries of arts and sciences will be held at the lab to encourage innovation and entrepreneurship in the community. The museum will also award grants to other museums and institutions that support projects that explore the interactions of art and technology. Tuchman believed that a need for an alliance between arts and technology was one of the most pressing issues of the time. This idea was revolutionary in 1967. Now it plays an increasingly important role in conversations and debates about arts funding and education, sparking movements such as stemtosteam.org, which advocates for the arts by highlighting their critical role in innovation, creativity, and collaboration. What kind of arts and technology collaborations are happening in your community?